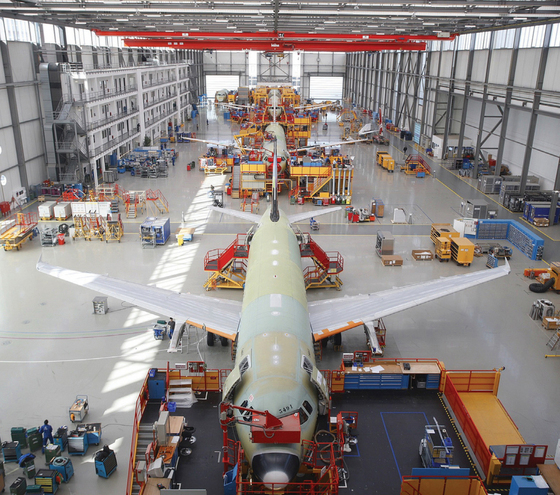 Airbus A320 Assembly – A truly international effort. countries; U.K., France and West Germany. Each wanted to have a greater role. These “Work Share Arguments” centered around prestige as well as money. In the end it came down to how willing the respective governments were to subsidise their aerospace companies. In March 1984 an agreement was reached and production began with 96 airplanes ordered from 5 carriers. 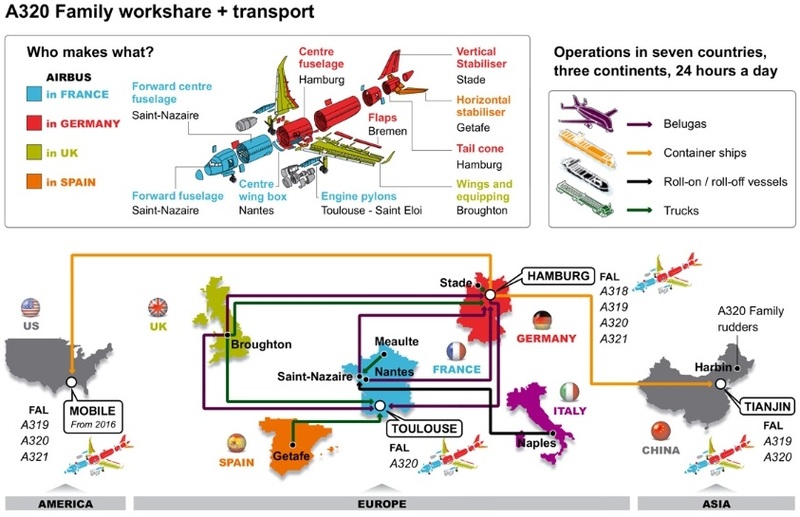 The graphic below, courtesy of Airbus, best describes the international collaboration required to produce one A320. From places like; Mobile Alabama to Saint Nazaire France, Hamburg Germany, Getafe Spain, Taijin China, Broughton UK, parts are created to be sent to the various assembly plants. Transportation is by road, roll-on, roll-off ships, train and specially built Beluga air transporters. The graphic shows the international collaboration required to bring together the Airbus A320. As with any modern airplane, construction of various components is spread across dozens of companies from many countries around the world. They range from makers of fasteners, adhesives and ball bearings to fuselage sections and wings. 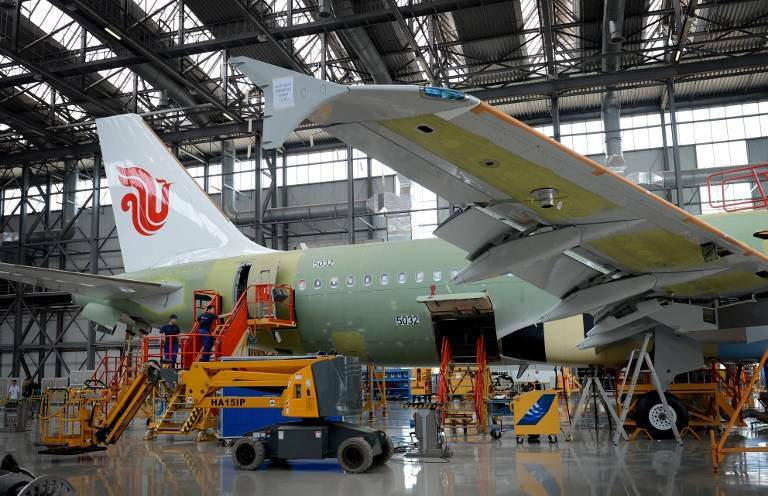 An Airbus A320 for Air China nears completion in the Tianjin, China factory. 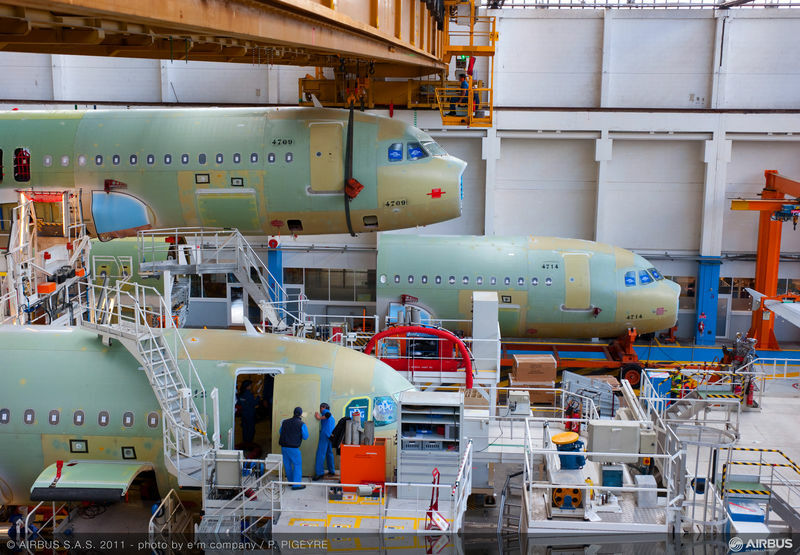 To enable the A320 to be quick to market, Airbus have built factories in Toulouse, Hamburg, Mobile Alabama and Taijin China. 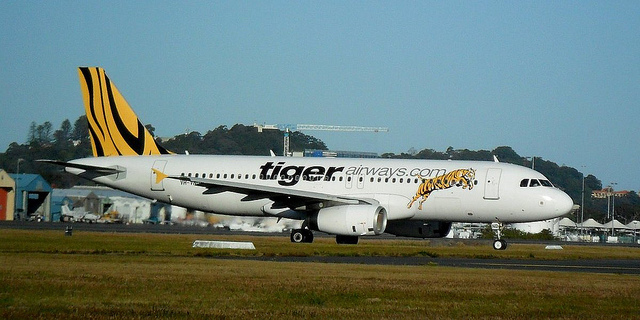 Toulouse is responsible for assembling A320s, whilst Hamburg assembles A318s, A319s and A321s. Taijin in China produces A319s and A320s, while Mobile Alabama assembles A319s, A320s and A321s, under the name of Airbus U.S. Manufacturing Facility. The fuselages arrive at the assembly plants by either Beluga aircraft in the case of Hamburg and Toulouse or container ship in the case of Taijin and Mobile. The forward section is built in France whilst the after section is built in Germany. At the assembly plant they are first moved to Station 41 where the two parts are joined together and so the process begins. From Station 41 the joined fuselage is then moved to either Station 40 or 35 which both perform the same function. The wings that were manufactured in the UK are then joined to the fuselage as are engine pylons, landing gear and other main components. Next the emerging aircraft is moved to a multi purpose bay where internal systems and cabin are installed and fully tested. From here they complete pressure testing, fuel testing, engine installation and run up testing and painting. The aircraft is then test flown and readied for acceptance by the customer. 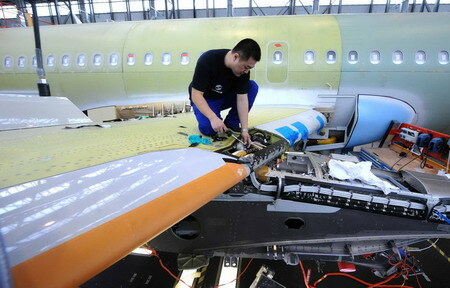 Wings made in China are attached to the fuselage of the Airbus A320. 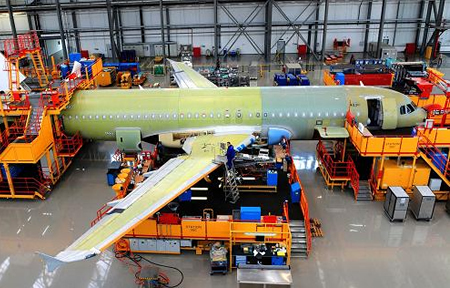 The production line of the Airbus A320 in Hamburg, Germany. 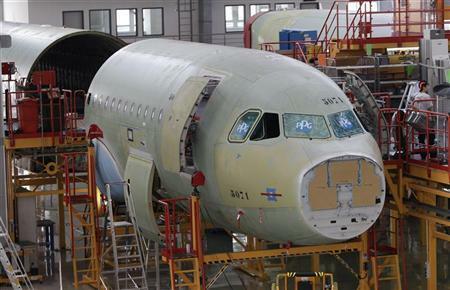 An Airbus A320 forward fuselage section is ready to be married to the rear section in Tianjin, China. The rear section of the Airbus A320 fuselage including the wing box. A worker adjusting the engine pylon on an Airbus A320 in Tianjin, China. Airbus A320 forward fuselage sections. 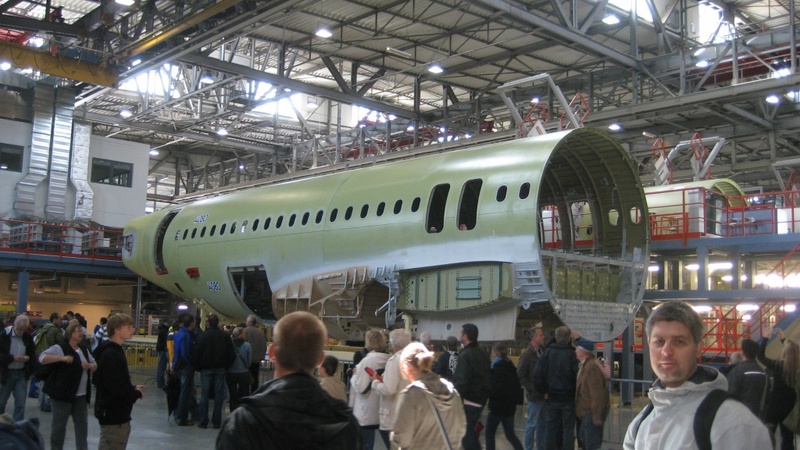 It currently takes 8 months to build a single A320 airplane. If there is more you want to learn about this airliner, please visit: A320 Specs, A320 Interior, A320 Order Book and A320 History. Thanks Adam, there will be more coming soon. Feel free to leave any ideas of what you would like to see here.